Spasms of Accommodation: NPR, AP, and Reuters Respectful in Space. Fox, Not So Much. NPR, AP, and Reuters Respectful in Space. Fox, Not So Much. I just watched the NASA TV feed of Cady Coleman and Mark Kelly doing interviews with earth-based news organizations. First they talked to Scott Simon at NPR. It kind of made my eyes well up a little bit to hear his voice on NASA TV. I think it got Cady Coleman a little bit too. I wonder if they're saving this interview for Saturday? I was so proud he only asked them about the science they're doing and didn't even mention Gabby Giffords. The AP reporter did the signal check and then immediately asked Mark Kelly if he had talked to his wife after her surgery and how was she doing. He told her he hadn't talked to his wife today because of their different schedule, but he had swapped email with her surgeon and she was fine. He had talked to his brother Scott. They quickly moved on to questions about the mission. The Reuters interviewer also jumped right in with the signal check and then asked a few good questions. But then it was Fox's turn. When their audio came up they were in the middle of another story. There was just some unrelated audio going on and on. Finally a voice came on and said they would be with them in 2 minutes. What the hell? Who does Fox News think they are? Two minutes is FOREVER when you're doing nothing and have a ton of work waiting to be done. They made them listen to a whole bunch of jabbering. Mark and Cady looked like they were telling jokes about it. (See screen grab) Fox was completely unprofessional in comparison to the three that went before them. The interviewer of course asked about Gabby Giffords and then at the end of Mark's answer he said, "Oh, that's fantastic. I'm sure you miss her and she misses you." What? What kind of reporting is this? Then he asked Mark to show them Gabby's ring around his neck and the rubber bracelet embossed with some message about her. It was just embarrassing. 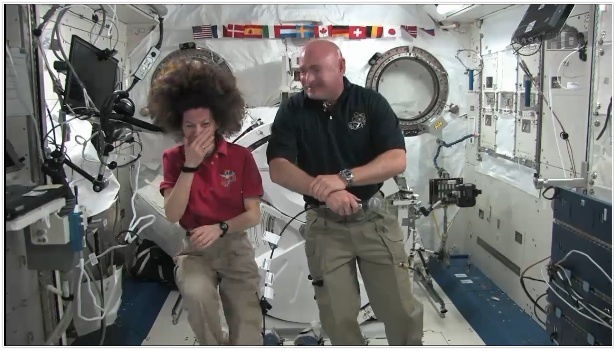 Cady Coleman accidentally called Mark Kelly "Scott" when they were talking to Scott Simon. She didn't stand a chance. Maybe if she'd been talking to Ira Flatow she would have kept the Kellys straight. I think Mark was messing with her about it while they waited for Fox News to get around to talking to them.